With this model of the MINOX BL series, the renowned optical specialist from Wetzlar has added powerful binoculars with a high magnification factor to its product range. The MINOX BL 15x56 is the perfect tool for hunting and observing game, especially at long distances. With their large light-gathering power, they are in a class of their own in twilight conditions. With a very low weight and robust design, the BL 15x56 binoculars offer the discerning user the very best of uncompromising quality. In the highly successful product range of MINOX binoculars, the MINOX BL series is the line distinguished by a particularly lightweight design – this being indicated by the letter L in its name. The special material properties of polycarbonate, provide a light and sturdy binocular body. The ergonomic design and rubber armoring make the new MINOX BL 15x56 easy and reliable to hold. Thanks to the high magnification factor this model is superb for viewing objects at long distances. The brilliant resolution of the high quality MINOX BL optical system allows the user to pick out the game fast and reliably, even in difficult light conditions. The new metal focusing wheel with fine rubber ribs is fast and convenient to use and features a finger-felt marking for the infinite setting. By feeling the actual setting the hunter can quickly focus on the wild boar in view, even in deep twilight. Designed for the raised stand in twilight and for long distances, the MINOX BL 15x56 has been fitted with a tripod thread. With resting forearms the binoculars can be moved quickly and steadily. As an alternative, a tripod can be used that is attached to the tripod thread using a quick-action adaptor. The powerful optical system of the BL binoculars has multi-coated lenses that guarantee highest optical performance and neutral color rendition of the subject in view. Thanks to the roof prisms with phase correction coating the user enjoys an image with excellent detail rendition and also high contrast in all light conditions. A nitrogen filling on the inside of the binoculars prevents fogging of the glass surfaces even under severe temperature fluctuations, also providing a permanent protection against corrosion. A sophisticated sealing technology makes the BL 15x56 watertight down to a depth of five meters. Also, the individual requirements of persons wearing glasses are accounted for at MINOX. With the extended eye relief, the entire field of view can be enjoyed without vignetting, even for those wearing glasses. Twist-type retractable rubber eyecups with individual click stops are another convenient feature. 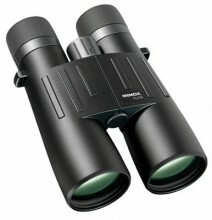 Click the button below to add the MINOX Binoculars BL 15x56 to your wish list.